The approaching sunset marks the end of the day on this farm. I couldn’t help but to also think that metaphorically it also represents the sunset of the era of the small farm. They are not all gone, but certainly it’s hard to deny that we are getting to the end of the day. Just about all the symbols of farm life in this image are out of touch with the reality of today’s farm. We no longer build barns like that or silos like that. The land though, continues on. 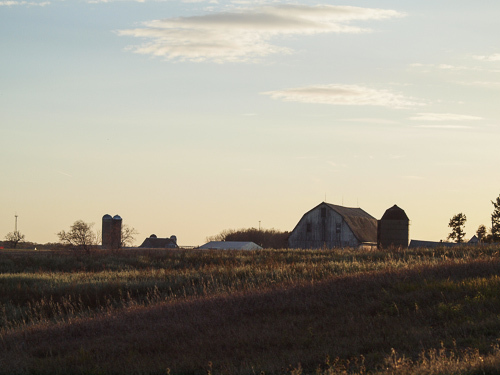 This entry was posted in Uncategorized and tagged agriculture, barn, blue sky, copyright ryan ware, family farm, farm site, golden hour, silo, wood barn. Bookmark the permalink. That’s why your work is so important, photographing these fading rural landmarks. Thank you for doing so.